This post is something I wanted to show you already since a very long time. I have seen so many fisherman walking around with a boat full of things going out for pike fishing. I want to show you what I’m carrying around with me and what became essential. I’m usually somebody who like to the on the save side but when I go out for fishing I prefer simplicity. The brands actually do not matter much but in general I prefer buying once an expensive tool rather than buying many time something cheap. And for some other things like the polarized sunglasses I do not make any compromises because they might save you from a fly in your eyes. 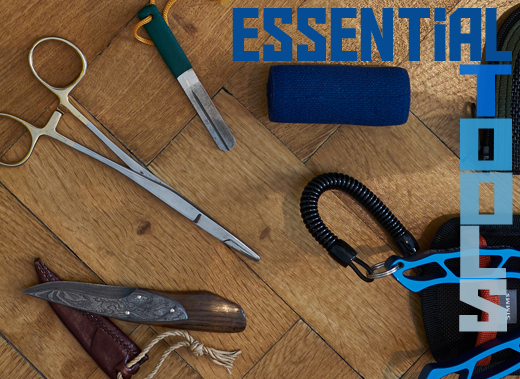 1) So lets get started with the most important tool you must carry around. Long pliers!! If you forgot or can’t find it stop fishing or at least find an alternative before continuing fishing. I’m not talking about the seven hundred teeth of a pike that can injure you seriously within a seconds. I’m more concerned about the pike. I have seen people dealing with pikes having no idea to get to hook out of a pikes mouth. If you ever come into this situation the best is to cut the wire as close as possible and hope that the hook rusts away soon. Those pliers can be cheap but never go out without them. I like the most the super simple ones shown on the picture. They are sturdy and light so that I can carry them everywhere also for wade fishing. They more or less also cut wire trace in an emergency situation. 3) The second most important tools I never go out without is a hook sharpener. There is nothing more miserable than fishing with a blunt hook. Pikes have very hard mouths so you can dramatically increase your hookups by using sharp hooks. To test whether a hook is sharp or not you can try the fingernail test. I try to puncture softly my thumbnail with the hook. This must work without any force even if you adjust the angle of puncture. If you just make scratches you know its not as sharp as it should be. I also do this test with brand new hooks. Most of them I sharpen out of the box. 5) Directly behind the Fly line tip wallet what else can it be rather than a leader wallet. In there are all my preassembled spare leaders, snaps, spare wire traces and tippet. You go best if you carry at least two preassembled spare leaders with you. If you ever tried to tie a albright knot with frozen fingers you will agree with me. 6) I use a stripping guard always and every time. I do not leave the house without one. I do have them in my car, my jacket, my fishing bag, the belly boat and even a spare one in my leader wallet. I can’t fish without them. Its my habit to use them. It feels uncomfortable fishing without. These is a ordinary self-adhesive bandage you get in every drugstore. For pike fly fishing I consider them as essential because we are constantly stripping fly line through our fingers. It prevents the fly line cutting into your finger. It also provides a more smooth retrieve of the fly and a better contact to it. 7) Spare tippet and wire trace is always with me. I rarely use it out on the water because I tend to pack prefabricated leaders too but since they are always in my leader wallet I can rely to find them whenever I need them. To be precise I only use Fluorocarbon tippets in 20lbs and 12lbs Knot2Kinky 1×7 titanium wire trace that didn’t let me down in the last 3 years (more in a review soon). 8) It is always good to have a sharp knife with you. Mine was a present from my wife a few years back. Its a kind of a special knife which will last a life long If I don’t loose it. Its made from damask steel with a grip from mammoth bone. That’s an overkill but I like my small handy knife. On the very few occasion I take a fish home for the table its my first choice and for everything else too. 9) On the very last places comes something that saves your life if you need it but may not be super essential. I talk about high quality saltwater pliers such as the one from SIMMS. This is a multi purpose work tool I use for prefabricate my leaders, cutting wire traces and hooks if a hook got stuck where it shouldn’t be. Or even better to de-barb the hooks with it. 10) I also carry a small tape measure with me. I don’t use it that often but sometimes I found it very useful to measure a pike whether its a new personal best or not. 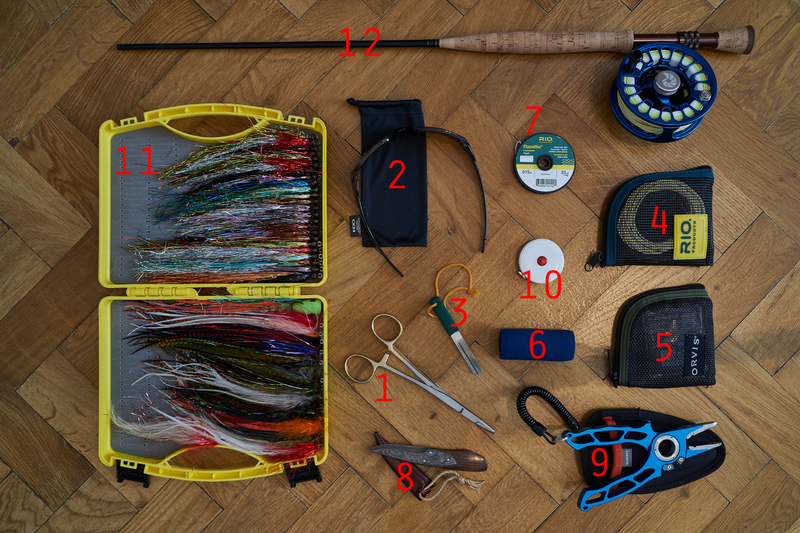 12) On the last place very surprisingly there is the my fly rod and reel. Yes of course fly rod and reel is super important but I wanted to put the focus more on the tools. Just see them as place holders in this post. I hope this might help you in packing your bag. Soon the season is coming and the pikes are hungry for your flies. 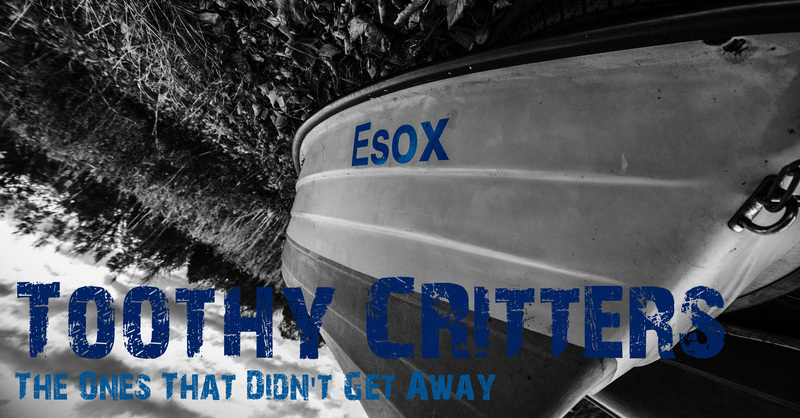 This entry was posted in Blog, Gear Reviews and tagged Fliegenfischen, Fly box, Fly fishing, Fly Line, Fly rod, Hecht, Leader vallet, Pike Flies, Pike fly fishing, Pliers, Reel, tippet. You have given a comprehensive list of tools, but I’m curious about the omission of jaw spreaders. I’d be hesitant to take a beautiful knife like that out on the water. If there is one thing that you really don’t need else than a Boga Grip it is a jaw spreader. This tools damage more than they are a help for you. Land a pike with your hand and each pikes opens his mouth from its own. The bigger pikes more than the smaller ones. For smaller ones you can user your thumb of your left hand (pike landed with left hand) to open the mouth carefully.